Cancer is a growing epidemic that affects millions of people every year. Cancer is in fact not so much a specific disease, but a process that can affect the cells in your body, causing them to grow abnormally and impair the function of nearby tissues. Understanding this process and what may cause this abnormal growth to begin is an essential first step toward managing this disease in the future. The term cancer refers to a group of over 100 diseases that stem from out of control cell growth. When cells become damaged and begin to divide at an out of control rate it will cause a mass of tissue known as a tumor to form. As these tumors get progressively larger they can interfere with the body’s natural processes including the circulatory, digestive and nervous systems. Some tumors also release hormones that will alter the way your body functions, leading to additional health damage. Types of cancer are typically classified based on the kind of cells that happen when this occurs. Cancerous tumors can form because the affected cells are creating new blood vessels that feed this increase in tissue or because the cells themselves move throughout the body and create new growth as it invades different areas. In this case, the cancer is going through a process known as metastasis, which can be quite severe. A distinct exception to these rules is leukemia, which grows within the blood stream itself, impairing the natural function of this system over time. Understanding what cancer cells are is only the first step in understanding the disease as a whole. You will also need to understand how different triggers play a role in causing this disease to appear. Knowing your risk can help you and your doctor understand what steps might be necessary in reducing your risk for developing the disease. Ultimately, cancer is caused by cells that begin to grow at an uncontrollable rate without dying. 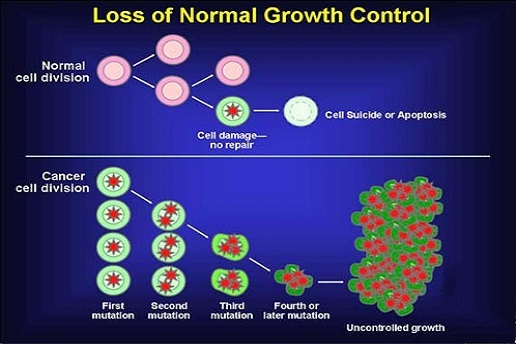 In normal circumstances cells will grow, divide and die off, a process known as apoptosis. When this system does not function like it should, cancer cells that do not have a programmatic death will begin to grow and divide without dying off, causing them to grow out of control. There is no single cause that will lead to this occurrence, but there are some circumstances that can increase a patient’s risk of these abnormal cells developing. Carcinogens. Carcinogens are substances that are known to cause cells to grow into cancerous tumors. Cigarette smoke is a common example of a carcinogen that is known for causing cancer. However, not everyone who is exposed to carcinogens will develop tumors. The presence of other risk factors can increase the chances that carcinogens will have a negative effect on the body. Age. Many types of cancer take a long time to develop, particularly if they have a genetic link, which increases your risk of developing these diseases as you age. Age related cancers can develop due to an accident as the cell divides or because carcinogens have damaged the tissue, causing abnormal cells to start dividing in this area. Genes. Genetic mutations that a person inherits can cause their cells to develop abnormally, increasing their risk that they will develop specific types of cancer. Those that have a history of a particular cancer in their family may need to get tested for these specific genetic mutations so you can fully understand your chances of developing the disease yourself. Immune System. Those that have a compromised immune system may be more susceptible to lymphomas as well as cancers like cervical cancers that are spread by a virus. Those that have HIV/AIDS, have had to take immune suppressing drugs for an organ transplant, are born with a disease that weakens their immune system or are battling a chronic infection are at a higher risk for developing these types of cancers. If the immune system is weak this also means that the existing cells in this system will need to divide more frequently, increasing the risk of a mutation occurring and spreading. Environment. If the environment you work or live in everyday is filled with carcinogens such as asbestos, radiation, direct sunlight, tobacco smoke or other work place hazards you may be putting yourself at risk for developing a variety of types of cancer. Viruses. Some types of cancer including primary liver, cervical, t-cell leukemia and lymphoma cancers are spread by a virus that can alter the genetic makeup of your cells. Not all that are infected with this virus will develop cancer, but these viruses can increase your overall risk of cancer occurring, particularly if you already have another infection that your body is attempting to manage at the time. Bacteria. Some studies have shown that bacteria such as the helicobacter pylori may increase your risk of developing stomach or bowel cancer if this infection is not treated properly. Lifestyle Factors. Lifestyle factors such as diet, tobacco, body weight and physical activity can also play a role in whether or not you develop cancer. Eating processed foods and meat over fruits and vegetables robs the body of essential nutrients that will allow the cells to divide and multiply in a healthy way. Those that are overweight also put more strain on their body, which can impact the body’s ability to deal with these abnormal growths as they arise. Finally, failing to get enough exercise can weaken the systems of your body, limiting your body’s ability to deal with a threat like cancer.